398 pages | 122 B/W Illus. 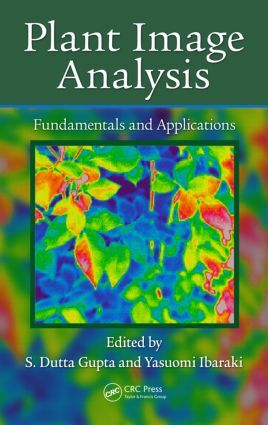 Plant Image Analysis: Fundamentals and Applications introduces the basic concepts of image analysis and discusses various techniques in plant imaging, their applications, and future potential. Several types of imaging techniques are discussed including RGB, hyperspectral, thermal, PRI, chlorophyll fluorescence, ROS, and chromosome imaging. The book also covers the use of these techniques in assessing plant growth, early detection of disease and stress, fruit crop yield, plant chromosome analysis, plant phenotyping, and nutrient status both in vivo and in vitro. "Plant Image Analysis: Fundamentals and Applications is a comprehensive compilation of methods currently used for image analysis of higher plants. The book presents both fundamentals of plant imaging as well as a variety of specific techniques, hence it can be of interest to wide spectrum of plant biologists (PhD students, lecturers, biologists working in agriculture and plant biotechnology). The book is timely: Plant image analysis is widely used nowadays and there are no such books on the market that are fully dedicated to plant image analysis. There are 16 chapters in this book, covering overall a broad spectrum of fields and techniques…. The chapters are written by experts in the fields. Most of the chapters present a good background and biological relevance. Overall, this is an excellent book to raise awareness about plant image analysis and can be a useful addition to the library of students, teachers, and biologists interested in the methods and applications of plant imaging." "The present book is worth having for the purpose of teaching and research in Universities/Institutes dealing with emerging areas of plant and agricultural sciences. I believe it will play a pivotal role in providing the necessary impetus for entering into this fascinating field of "Plant Image Analysis" with or without any background of computer vision." "S. Dutta Gupta and Yasuomi Ibaraki outlined the broad topic they have addressed. They lead the discussion from the very basic explanation of the concept of imagery through the description of various techniques to the imagery application in plant biology, medicine and agriculture. … the authors provide an in-depth explanation of the matter thus anticipating the wide use of the described material not only by plant professionals but also as a comprehensive teaching tool for graduate and PhD. Students…. The authors made an enormous effort to put all presented information together in a well-thought and structured manner. The color inserts allow readers to get the big understanding of the overall imaging idea in plant analysis, while the specific examples and case studies support and explain in much detail the topic of each chapter, guiding the reader through the pros and cons of each described technique and make this book the valuable source of both theoretical information and practical advice from the pioneers and world-renowned experts." S. Dutta Gupta is a professor in the Department of Agricultural and Food Engineering at the Indian Institute of Technology Kharagpur. Dr. Gupta has been engaged in teaching and research on plant tissue culture and biotechnology for more than 25 years. He is a pioneer in the application of imaging techniques in plant tissue culture system for noninvasive estimation of photosynthetic parameters. Dr. Dutta Gupta has received fellowships from various agencies and governments such as the USDA, Lockheed Martin, MHRD, INSA, CSIR, DST, Czech Academy of Sciences, and JSPS. He has published more than 100 scientific articles. Yasuomi Ibaraki is a professor in the Faculty of Agriculture at Yamaguchi University, Japan. Dr. Ibaraki has been involved in studies on image-analysis-based evaluation of plants in micropropagation and protected cultivation for more than 20 years. He has made significant contributions in the imaging of somatic embryos, suspension cultures, and plantlets. He also has made contributions to image-based estimation of leaf area index and light intensity distribution on canopy surfaces. Dr. Ibaraki holds a Japanese patent on a method for evaluating quality of plant cell suspension culture by image analysis.